Grandview Beach is located just one block north of Grandview and Neptune streets. 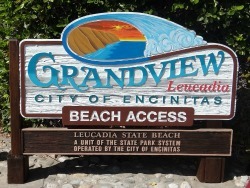 This is part of the Califonnia state parks and is operated by the City of Encinitas as Lucadia State Beach. Accessible by a set of stairs situated on a bluff above the ocean, it is the northernmost in a series of Encinitas beaches. Looking out to the beach through the framed palms, you feel like you found paradise.